The essay is the last section on the ACT, and it comes right after a little break. So you're going to get a snack, stretch, what have you, and then get yourself ready for this last 40 minute push. In this lesson I'm gonna talk to you a little bit about how to use those 40 minutes. And then also how to do some practice beforehand with the timing of it all. So you know that trick where I was telling you to reset your clock to 12 at the beginning of each section to make it easier to keep track of time? Well what do you know, for this one, you might not even have to reset your clock, or maybe just by two or three minutes. But that's because the essay will be beginning at right around noon. And those 40 minutes are gonna go by really fast, but frankly, this is the least time crunchy section of the exam. Up until just a couple years ago, students only had 30 minutes for the essay. And then a few years ago they increased the time. They really did that for your benefit. They wanted to give you more time to plan, to organize. And if there's one thing, there's one takeaway from this lesson, it's that you should use a lot of time planning. At least ten minutes I would say, 15 minutes is on the upper end. Let's look at some more specific guidelines. High scoring essays are really not all that incredibly long, maybe a page and half or something like that in average sized print. But they have the perfect examples in organization. All of that happens in the planning stage. So figure this out before you go into the writing so you don't get stuck with weak examples or rambling organization. I recommend you spend one minute reading the prompt and perspectives. Although it often helps to kind of come up with a gut instinct perspective immediately, during this first minute don't continue to read and reread the prompt assuming that will give you some flash of inspiration for your ideas. That first minute is really just to absorb. You are going to get your better ideas with a piece of paper in front you, not looking at the prompt over and over again. All right, so trust us on this. Watch our other videos on how to generate ideas and plan. Also don't comment to anything right away. In the next three to five minutes brainstorm what your perspective or stance on the issue might be, as well as specific examples for different perspectives. Now you just might wind up writing about one perspective, but during this planning stage I want you to brainstorm for at least two of them. The strength of the examples you're able to come up with will often dictate your entire paper and what you decide to argue and or defend. And then spend six to nine minutes finalizing your perspective, developing your thesis, and outlining your essay. That's quite a bit to do in six to nine minutes. But a lot of your examples in choosing will come at this stage, and then this thesis in the outline. Let's break down the 20 to 25 minute writing period a little more. Okay, so I want you to spend about three minutes on your intro paragraph. Now when I am in the classroom as a professor, I tell students to do their intro last. This is not the time for flexibility. You plan, you spent a lot of time planning, and then once you start writing, you commit. Okay, so just go ahead and do the intro first. It's gonna help lock you in to your plan. Then spend five to seven minutes writing each body paragraph, I think six is a good number to aim for. Your body paragraphs are by far the most important part of your essay. And one thing I'll say here is that a lot of people get stuck because they put so much time into their first body paragraph. But usually it's your second and your third, those are the paragraphs that require a little bit more analysis, a little bit more defending and argumentation. The first one tends to be pretty straight forward, it's kinda just like your basic example. So for your first one you might wanna aim closer to five minutes for your first body paragraph, so that you have more time for these others that require more analysis and argument. And again, I really wanna emphasize, I'm just trying to give you a sense of the overall rhythm. You don't have to use my guidelines word for word, and you definitely don't have to memorize any of these subcomponents, okay. These are guideline suggestions by making it highly visual, because I just want to give you sort of a qualitative sense. And then two to three minutes for the conclusion. The conclusion is not as important as the other parts of your essay. If you're running out of time, a one sentence conclusion, just like a recap, is good enough. Ideally your conclusion will be two to three sentences. But if you're running out of time, you have four minutes left until time is up, let's say, super quick, one sentence. Conclusion just basically restates your thesis so that you have time to proofread. Proofreading is more important than having a full conclusion. In these last two to four minutes you're just going to be looking mostly to see how your words and punctuation are kinda looking. You're cleaning up sentences. This is not the time to decided that you want to add an entirely new example. You have to discipline yourself. What I find I'm often doing helping students in the proofreading stage is helping them get rid of redundancies. Certain words might just keep coming up, and it really detracts from your message and your thoughts. If you keep using the same word or variations of the same word over and over again. And this is also a time where you can kind of maybe make some of your longer sentences shorter to change the rhythm a bit. Punctuation and word choice, that's most of what is going on here. You might have to do a little bit of rearrangement, but that's not the main thing. So if you don't feel like making yourself crazy with all these two tests, what should you track while you're actually writing the essay? I'm in favor of visual cues. 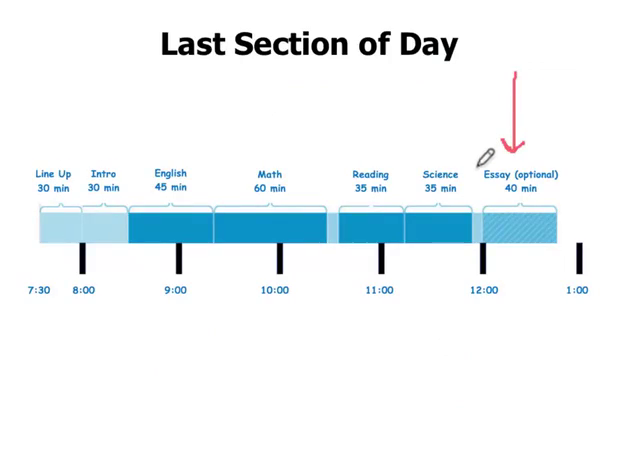 You will have reset your watch to noon, assuming that it's not already noon when the proctor begins the essay. So this is your cue to start writing, 12:15. And absolutely not before the 12:10 mark. So somewhere in here is when you should start writing. Before that you can just barely glance at the clock couple times, so you know you're getting close to 12:15. And then at 12:15, that's your time to ask yourself, and am I beginning to write? Conversely what you can do is when you get to the end of your planning stage and you're ready to write, you can see, is it at least 12:10? If it's 12:08, plan a little more, add some more detail to your outline. When the clock strikes 12:30, you are ideally in the middle of writing your third body paragraph. If you haven't started your third body paragraph by 12:30, that's a great time to just wrap up your second body paragraph and start whipping out the third. The second body paragraph is probably gonna get the least amount of attention anyway of the three, so you do want to make sure you have enough time for the third. And by attention, I mean attention from the graders. Conversely, when you finish your second paragraph and you're getting ready to start your third, you're in good shape if the time is somewhere between 12:25 and 12:30. This is a great time to be starting your third body paragraph. At that point, you have ten minutes left to finish your third body paragraph, write your very short conclusion, and just take a couple minutes proofreading. I said I wanna give you the rhythm. In order to get a sense of the rhythm, aside from just looking at my little pictures, you wanna practice, right. And I like the essay for this reason. I think it's a really nice way to wrap up a study session, ACT study session, because you can make progress in pretty short chunks of time. So for instance, you always want to have a list of backup topics handy. You can find examples by doing web searches for controversial issues. And then just choose three simple perspectives. One perspective can always be in favor for, one can be opposed to, a third can be in favor for except for with children, or in favor for unless tax dollars are involved. Don't worry too much about the three perspectives you come up with. When you first start practicing you want to be generating outlines. All right, that means set the clock for 15 minutes and go through an entire practice planning session. Take one of these topics randomly, you can just do a random number generator thing on your phone and just come up with one of the topics in your list. Set your clock or watch for 15 minutes, and go through a whole planning session. Very important is to save all your outlines from these early 15 minute planning sessions. Once you have some outlines for fodder, you can do some nine minute practice sessions where you write an introduction and one body paragraph. It doesn't have to be the first either. You might actually want to do your introduction and your third body paragraph. It won't have quite the same natural rhythm as going from the intro to the first, but I want to get you used to this idea that your third body paragraph deserves a fair amount of practice. And then once you've done plenty of those sessions, you can just throw in little six minute sessions. Say you did a bunch of math practice that day. You still have a little bit of energy left, especially for a whole different subject like writing. Set your clock for six minutes, always have your outlines handy, and just write one of your body paragraphs, one of the ones you haven't written yet.